At the Denver factory of Hammond's Candies, two weeks before Christmas means one thing: It's candy cane crunch time. The 93-year-old business isn't just the oldest handmade candy maker in America -- it's also the nation's largest producer of handmade candy canes. "December is a crazy time in our factory," said Andrew Schuman, owner and CEO of Hammond's Candies. 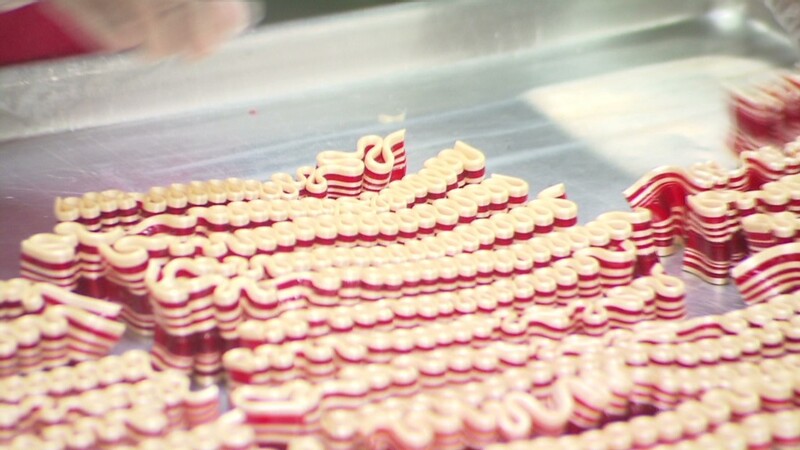 Hammond's churns out nearly 7 million candy canes every year, each rolled, shaped and cut by hand. They're almost all produced in the second half of the year. Candy canes are 50% of the company's business, but it also makes all-natural lollipops, ribbon candy, taffy and a signature confection called Mitchell Sweet -- a bite-sized marshmallow covered in caramel -- which has been produced since 1920. All of this is done in a single 35,000-square-foot facility where 120 people, including 10 cooks, work year-round making the sweets. The employees ramp up to 200 when production peaks in November. Making candy by hand is laborious, expensive and rare. Still, it's allowed Hammond's to distinguish itself from its competitors and stay alive for almost a century. Hammond's candy-cane recipe requires stirring a mix of sugar, water and corn syrup into large copper kettles and boiling the mixture. The liquid is then poured onto metal tables, where different colors are added and it's cooled into sheets. A red, white and green candy cane, for instance, involves taking a sheet of each color, cutting it into sections with industrial scissors and stretching and rolling the sheets together to create stripes. The bundle is heated, cut into strips and twisted into the cane shape. The candy canes come in 30 flavors and are sold at stores like Macy's (M), Nordstrom (JWN) and Whole Foods (WFM). Hammond's old-school manufacturing has made it a tourist attraction in the Mile High city. Schuman said about 100,000 people visit the factory every year. The business was started by Carl Hammond in 1920 and grew slowly over the decades. It remained a family-owned business until 1999, when the Hammonds sold it to a group of investors with expertise in the candy industry. "The business was making $300,000 in sales at the time," said Schuman. "The new owners ran it for eight years and grew sales into the millions, but profits didn't improve." At that point, Schuman was living in Maryland, working in his family's photo business but looking for another career path. Hammond's popped up on his radar after he saw a Wall Street Journal article saying the candymaker was for sale. "I wanted to buy a business I could turn around and make profitable," he said. He bought Hammond's in 2007 after a quick visit to Denver. It took Schuman a few years to get the traction he wanted. "Hammond's was focused on being a Christmas candy company rather than a candy company," said Schuman. "Even though the majority of our business is done later in the year, we wanted to grow our business and be perceived as a year-round company." He started by changing the culture, hiring new people and making production more efficient. "We also spent a lot of money on branding and creating a consistent look across all of our products," he said. By 2011, Hammond's had doubled employees, sales and profits. As Hammond's continues to grow, Schuman said he'll continue to "preserve the way things have been done here. We won't compromise on our quality and Made in America legacy."